An anonymous patron placed an ad requesting that the person who picked up his Hart Shaffner & Marx overcoat at Walter Hines‘ barber shop return it. Wilson Daily Times, 24 January 1922. 44 years in the barber business! 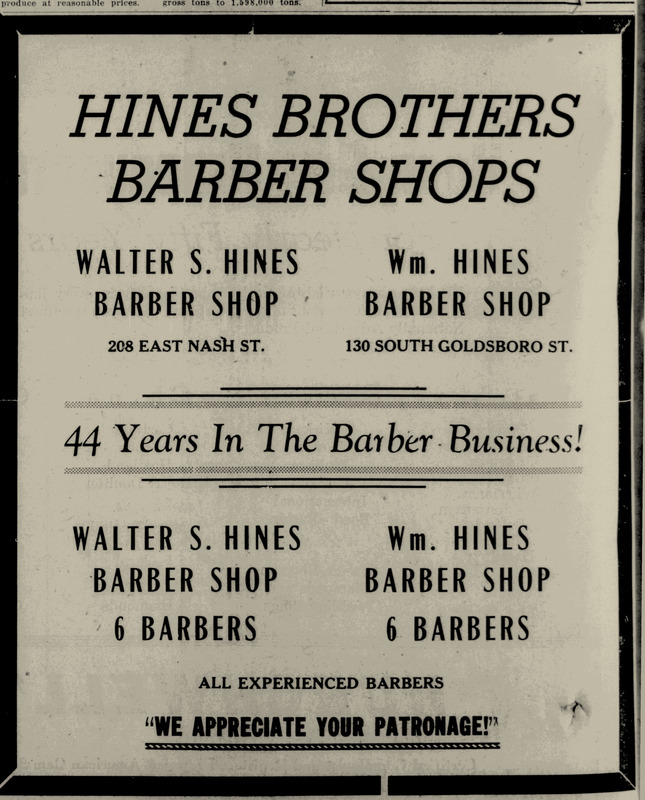 Brothers William Hines and Walter S. Hines opened their barbershops in 1902. Levi Jones buys a massage apparatus. In 1909, for $28, Levi H. Jones bought, subject to chattel mortgage, a Birtman Massage machine, 110 volt, 60 cycle, for his barber shop. Deed book 72, page 472, Register of Deeds Office, Wilson. A cash register for Tate & Hines. In May 1910, Walter S. Hines, on behalf of Tate & Hines Barbershop, 213 East Nash Street, purchased a sixty-dollar register from National Cash Register for use on the barbershop’s back counter. Model No. 317, National Cash Register Company. Deed book 72, page 570, Register of Deeds Office, Wilson; image of cash register courtesy of www.pinterest.com. Walter Hines Barber Shop, 208 East Nash Street, circa early 1940s. In the era of segregation, the barbering trade was dominated by African-American practitioners, who operated black- or white-only shops. The Hines brothers, Walter and William, owned prominent white-only establishments in Wilson’s downtown business district. Joe Knolly Zachary (1900-1984) was born in Perquimans County, North Carolina, to Nathan and Penelope Zachary. He married Mildred Barnes, daughter of Sam and Ida Barnes, in Wilson in 1933. Rev. Charles T. Jones, whose brother Levi H. Jones was also a barber at Hines, performed the service, and Roderick Taylor (below) was a witness. Edgar Hiram Diggs (1890-1970) was born near Eureka, Wayne County, to Sula Diggs. He married Mary Estella Grant in Statesville, Iredell County, North Carolina, in 1923. Roderick Taylor (1883-1947) was born in Wilson to Henry Michael Taylor and Rachel Barnes (or Battle) Taylor. He married Mary John Pender in Wilson in 1906. Sidney Sherwood Boatwright (1900-1977) was born in Mullins, Marion County, South Carolina, to Collins and Dinah Blaine Boatwright. He married Johnnie Lee Kornegay in 1928 in Goldsboro, Wayne County. Original photograph in the collection of Lisa Y. Henderson.